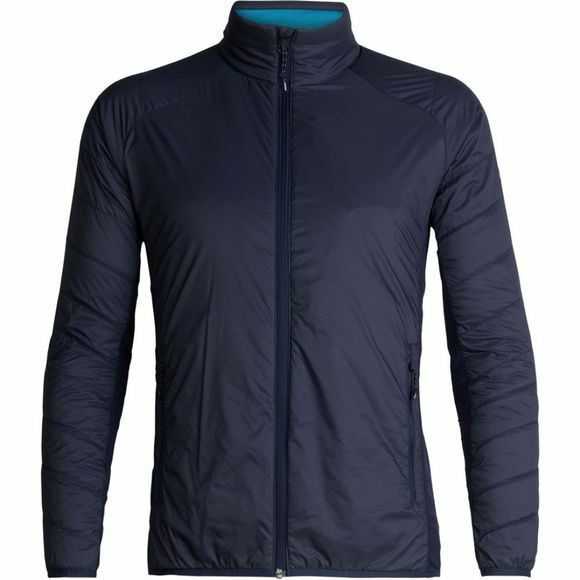 The Mens Hyperia Lite Hybrid LS Zip from Icebreaker feature an unmatched combination of warmth, lightweight packability and protection that’s crucial for alpine pursuits like climbing, skiing and trekking. A unique blend of technical performance with natural merino insulation. The Hyperia’s ultralight yet durable Pertex Quantum Air face fabric features a DWR finish that sheds variable conditions. Inside, we used our innovative 100g MerinoLOFT insulation, a sustainable and high-lofting alternative to synthetic fills that retains warmth even when wet. The Hyperia also features merino-blend stretch side panels to regulate body temperature, improve range of motion and keep you comfortable everywhere from local rock climbs to backcountry hut trips. Zippered hand pockets and an internal zip pocket store small essentials, offset shoulder seams eliminate chafing when you’re moving with a pack and the jacket stows in its internal pocket for premium packability.